Crane is the bird of God in Chinese culture. And it is a symbol of longevity. As a result, it is perfect to use them as the main graphical elements in a birthday invitation to for example the 60th birthday party. 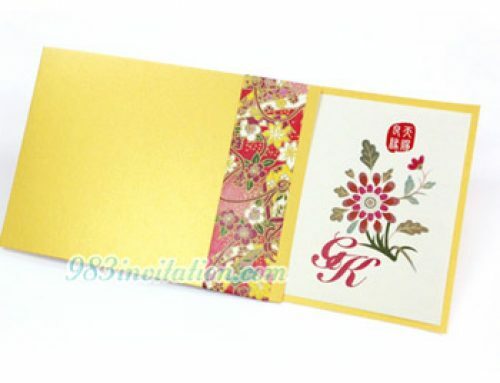 Colorful Chinese paper cutting pattern with Chinese calligraphy of longevity “壽” is printed. It creates a joyful and celebrating atmosphere. It will certainly be perfect and full of fun to have a 60th or even 70th birthday party. 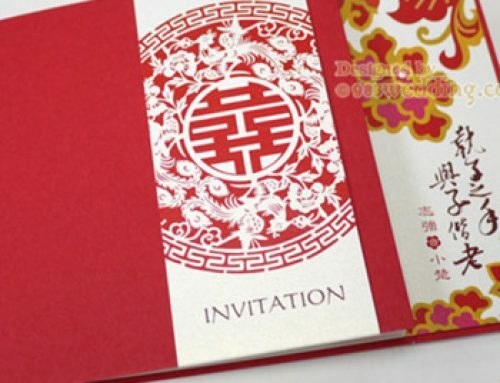 This modern Chinese birthday party invitation will certainly suit your needs. In fact, it is a Chinese tradition to arrange a big birthday party when people are 60 or even 70 years old. Chinese people use a lot of symbols and elements in terms of blessing and fortune in birthday parties. In this design, we have adapted some elements related to longevity. Usually, the Chinese character “壽” is used when we talk about the idea of longevity. There are quite a number of variations when writing or expressing this special character. One of such variations is shown in our design. 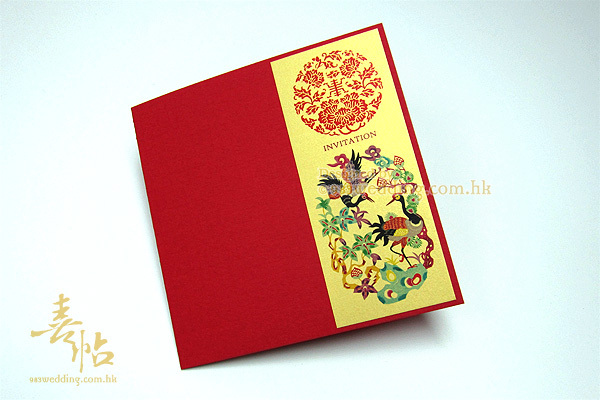 It is printed as a beautiful red color paper cutting pattern on the gold color strip of the cover. The character is surrounded by a lot of flowers and leaves. As the invitation will mainly be used for a 60th or 70th birthday party. Different types of symbols related to longevity are adapted in this design. In Chinese culture, crane birds are also something that bears the idea and notion of longevity. It is a kind of blessing when having these birds on the invitations. 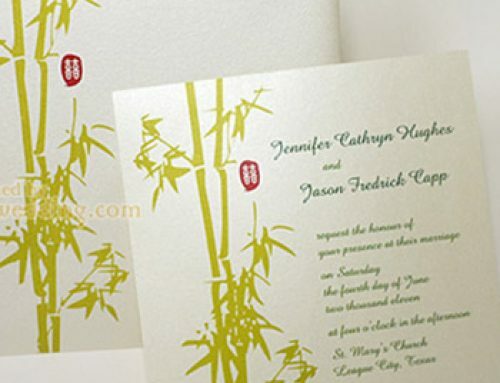 As a result, they are also printed on the golden color strip. 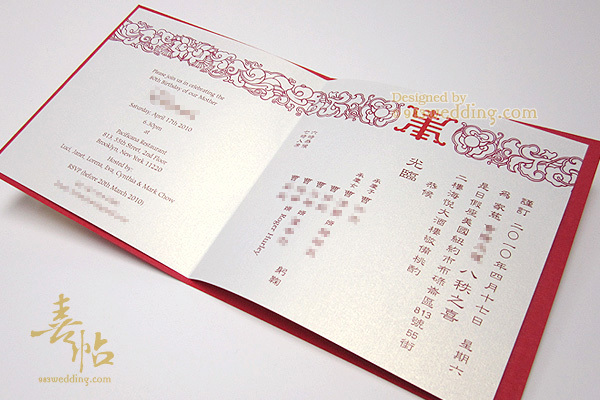 Since it is a modern Chinese design, we have chosen an off-white pearlized color for the insert. 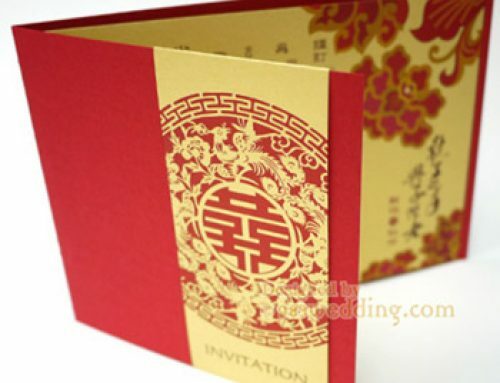 The Chinese character “壽”, which is in the same form of the one printed on the gold strip glued to the cover, appears again with a border on the top of the insert. Again, this character is print in red on the insert. The invitation wording will be printed below this nice border. The design of the insert is flexible. It is very true that some people may not want to have off-white color for their 60th or 70th birthday party invitations. It will not be a problem to change the color of the insert to gold color if you want to do so! 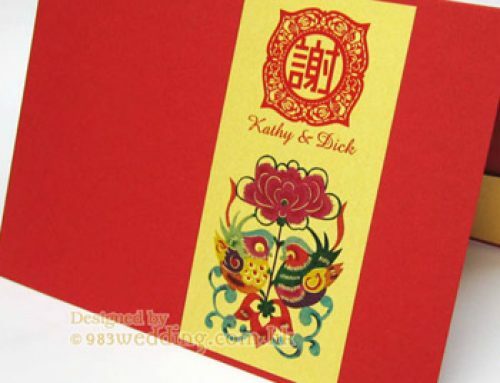 210gsm red color paper mounted with 250gsm gold color paper with an insert in full-color printing on ONE side.